Identification: Oriental bittersweet is a deciduous, twining and climbing woody vine. It entwines its round, brown stems about other plants and structures, climbing as high as sixty feet, forming thicket and arbor infestations. It has elliptic to rounded leaves, with dangling clusters of inconspicuous yellowish flowers producing green/yellow fruits which split in Autumn to reveal showy bright red seeds. Oriental bittersweet is similar in appearance to American bittersweet and verification of identification is critical. One way to clearly distinguish between the two is by locating the female flowers and fruit of the plants. On Oriental bittersweet the flowers lay in clusters of three to seven, near where the stem attaches to the branch of the plant. In C. scandens, the now scarce native plant, they form in terminal clusters composed of multiple stalks, revealing numerous flowers or fruits. A less reliable difference is the color of the outer covering of the fruit. The fruit of Oriental bittersweet is yellow while American bittersweet fruit is orange. Original Distribution: Native to East Asia, including Japan, Korea, and China north of the Yangtze River. It is widely distributed in northern and central Japan and Korea. Habitat on its native continent of Asia is said to be lowland slopes or thickets at altitudes from 300 to 4200 ft.
Current Distribution: Naturalized in United States & New Zealand. 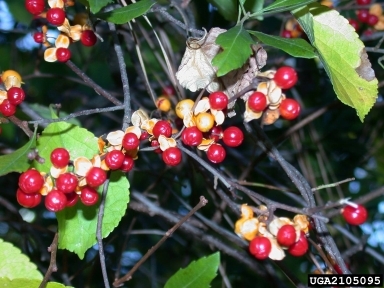 Particularly abundant in natural areas in coastal Connecticut and New York state and in the southern Appalachians, but may be found growing wild from Maine to Louisiana and the southeastern Great Plains. Upland meadows, thickets, young forests, and beaches are most vulnerable to invasion and dominance. Site and Date of Introduction: The exact date of introduction to eastern North America is unknown, but is believed to have been around 1860 and certainly before 1879. Mode(s) of Introduction: Introduced for ornamental purposes, subsequently escaped from cultivation. Note: While sales are prohibited in many states, it is still commercially grown and sold in others, often mislabeled as “American Bittersweet.” As a result, continued introduction in new locations is likely (see below). Reason(s) Why it has Become Established: The vine is highly attractive as an ornamental and easy to grow and propagate. It was formerly planted extensively in highway landscaping and for wildlife food and cover and erosion control. The viable fruits continue to be sold for dried flower arrangements and are frequently disposed of on compost and brush piles, where they can readily be spread by birds and small mammals. Once dispersed, habitat preferences are wide and include open woods, thickets, roadsides and fence rows. In contrast to the tropics, lianas (vines) are relatively uncommon in the northern temperate areas. The existence of a significant ecological niche in the temperate zone for lianas may account for the success of invasive species such as Pueraria montana (kudzu) and C. orbiculatus. Ecological Role: Considered an important winter food for birds, comparable in lipid and sugar content to the fruit of other species. Black-capped Chickadees, Northern Mockingbirds, European Starlings and Blue Jays feed on C. orbiculatus during the winter months. Hybridization with the native species C. scandens is possible, with loss of genetic identity. This is cited as a possible reason for the decline in distribution of the native in recent years. Other researchers, however, claim that the hybrid is weak and not commonly observed in natural settings. Benefit(s): In addition to their commercial value as ornamentals, plant extracts of the Celastraceae have been used for centuries throughout South America and China as insect repellents and insecticides in traditional agriculture, and also for the treatment of medical ailments from stomach complaints and fever to rheumatoid arthritis and cancer. Threat(s): C. orbiculatus poses a serious threat to individual plants and plant communities due to its high reproductive rate, long range dispersal, and rapid growth rates. Individual plants can be severely damaged and even killed by the aggressive twining and climbing growth habits of this vine. All types of plants, and even entire plant communities, can be over-topped and shaded by the vine's rapid vegetative growth. Direct competition between C. orbiculatus and C. scandens has been hypothesized as a cause for the decline of the native species. However, loss of suitable habitat may be the underlying reason for its decline, as the habitat preferred by the native (open landscape) has been declining due to forest regeneration and forest fire suppression. Control Level Diagnosis: Medium Priority. C. orbiculatus is still expanding its range in the Northeast and westward across the United States. It has been declared a noxious weed or invasive species by most states where it is found. Serious local infestations have occurred, e.g. Asheville, North Carolina, is a hub for oriental bittersweet invasion. Perhaps the most serious threat is the continued cultivation and sale of plants, leading to a continuous source of new introductions and further spread. Control Method: Manual, mechanical and chemical control methods are all effective; employing a combination of methods often yields the best results and may reduce potential impacts to native plants, animals and people. Low-growing populations have been successfully treated by cutting and applying triclopyr herbicide to the regrowth about a month later. Larger vines may be cut and the stump treated immediately with triclopyr herbicide. For large infestations spanning extensive areas of ground, a foliar herbicide may be the best choice rather than manual or mechanical means which could result in soil disturbance. Recovery of natural areas highly infested with C. orbiculatus is unpredictable. Even with complete removal and root kill of C. orbiculatus, substantial seedling regeneration occurs in following years, probably due to a persistent soil seed bank. In cases where all nearby seed sources cannot be eliminated, reinfestation is a continual possibility. No biological controls are currently available for this plant.